1. 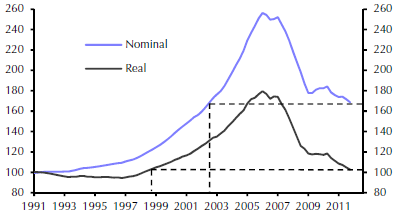 Measured on an inflation adjusted basis, US home prices are now at the 1999 levels. 2. 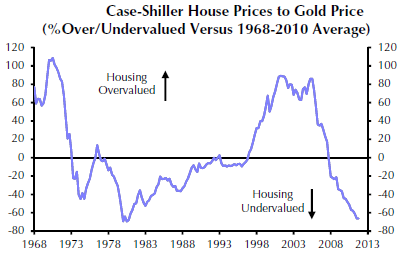 For those who don't believe the official inflation numbers, here is what US housing prices look like denominated in gold. 3. The most reliable way to benchmark housing in terms of relative value is to compare home prices to US households' disposable income as well as to the equivalent rental expenses. 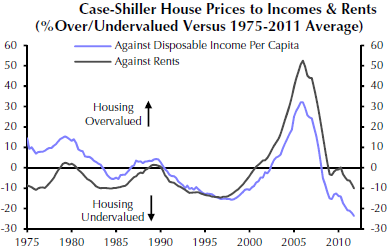 This shows both the absolute and the relative levels of home "affordability". Update: see Comments (below) - comparison to other parts of the world.